Cross-border ties among Latino immigrants are extensive and some home country attachments persist even after many years in the U.S. But should these continuing home country connections be thought of in terms of “transnationalism,” a concept implying that the immigrants’ “here-there” ties are a condition of being? Experts such as Alejandro Portes and Peggy Levitt contend that the situation of Latino immigrants today is unique. According to this view, the ease of travel and communication creates “transnational communities” that extend between the U.S. and the countries from which the immigrants came. Those who engage in these regular, here-there contacts comprise the “transmigrants.” Another interpretation is that cross-border connections are a natural byproduct of any migratory situation, as many migrants arrive with uncertain settlement plans that change only gradually. Consequently, the high volume of contemporary migration makes for extensive back-and-forth flows of many types that tend to decline with years of residence in the U.S.
One way of gaining insight into this debate is to first see whether there is a subgroup of immigrants who engage in an especially high level of cross-border activities and then determine whether that affects national identity and attachment. In this analysis, “transnationalism” is conceptualized as three regular and recurring activities that take place across borders: remittance sending, calling home at least once a week and recent travel (at least once within the two years prior to the survey). 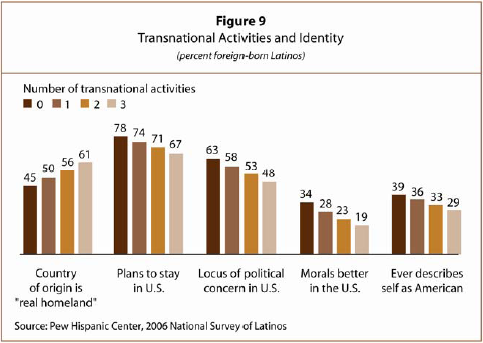 Immigrants who engaged in all three forms of cross-border activity are labeled “transmigrants.” By this measure, only 9% of Latino immigrants can be classified as transmigrants. At the other end of the spectrum are the immigrants who do not engage in any of these cross-border activities. Nearly three-in-ten foreign-born respondents (28%) say that they never sent remittances, had not traveled to their country of origin recently and did not make phone calls at least once a week. The share of immigrants in this category rose from 17% among those in the U.S. for 10 years or less to 43% of those in the country for 30 years or more. Most Latino immigrants fall between the two extremes of all three cross-border activities and none. On average, most respondents say they engage in a little more than one cross-border activity. Of those engaged in just one, half send remittances; the remainder is split between those who have traveled to their native country within the past two years and those who call home weekly. Of those engaged in two cross-border activities, 84% send remittances and 77% telephone weekly. Another way of measuring the extent of these activities is to construct a scale from zero to three that shows the extent to which these different cross-border activities are combined. For individuals, a score of zero indicates no cross-border activities; a score of one or two indicates involvement in any or two of the three possible cross-border activities; a score of three indicates involvement in all three activities. We also averaged these scores by national origin and year of arrival: these scores show how groups compare (Figure 7). Patterns vary greatly by national origin: on average, Cubans predictably fall at the low end of the scale, barely registering above zero, in contrast to Colombians whose average of 1.5 puts them at the high end. On average, Mexicans score at 1.2. Levels of cross-border activity decline with years spent in the U.S. Immigrants who have lived in the U.S. for 10 years or less have an average score of 1.5, while those in the country for at least 30 years average 0.8, meaning that recent arrivals are almost twice as likely as their most settled counterparts to engage in cross-border activities. The most relevant comparison contrasts Mexicans with non-Mexicans. Mexicans are distinctive, reflecting generally lower levels of cross-border activities, regardless of years of residence. 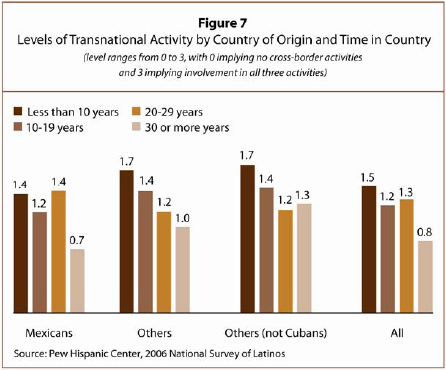 Mexicans who have lived in the U.S. for 30 years or longer also have a particularly sharp falloff in cross-border activities (Figure 7). Although the typical Hispanic immigrant is engaged in at least one of these three cross-border activities, “transmigrants” (those engaging in all three) comprise a much smaller group, accounting for just 9%. Though Cubans again are underrepresented and Colombians overrepresented among the transmigrants, relative differences are much greater. For all practical purposes, there are no Cuban transmigrants. By contrast, one-in-five Colombians qualifies as a transmigrant. That might be explained by the fact that compared with Mexicans, for example, the Colombian immigrant population includes a smaller share of unauthorized migrants and higher shares of affluent individuals. No less notable is the low proportion of transmigrants among Salvadorans (about five of every 100), suggesting that for this group “regular and recurrent” cross-border activities are constrained by low incomes and the fact that many are not authorized to be in the country. 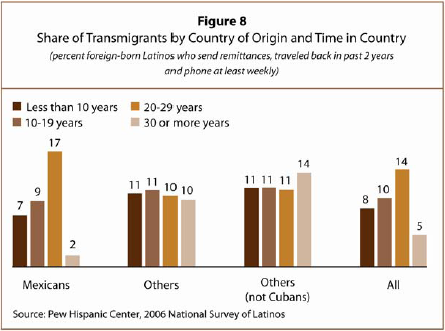 Transmigrants are somewhat more commonly found among Mexicans. Yet, notwithstanding Mexico’s proximity to the U.S. and the longevity of the migration, just eight out of every 100 Mexican respondents engage in all three forms of cross-border activity. The impact of years of residence in the U.S. also differs depending on place of origin. Among Mexicans, the proportion of transmigrants rises with each decade of settlement in the U.S. and then sharply falls among those who have lived in the country for 30 years or longer. By contrast, among all other non-Cuban residents, the proportion engaged in all three cross-border activities remains stable over time, increasing slightly among the most settled (Figure 8). No single factor determines which immigrants engage in all three cross-border activities. While years of residence in the U.S. is clearly influential, other characteristics—including language usage, citizenship status or whether immigrants have children in the home country—also matter. More importantly, these characteristics are correlated with one another, as longer-term residents are more likely to be U.S. citizens and are also more likely to be English-dominant speakers. A regression analysis was done to help identify important impacts when taking into account certain other variables, including national origin, years of residence in the U.S., citizenship, language usage, education, employment and marital status. The analysis reveals that once other related factors are taken into account, only a few characteristics make a difference (Table 2). After controlling for other factors, most national origin groups differ slightly, though with two notable exceptions. In other words, differences in characteristics such as citizenship, employment and education explain most of the differences among national origin groups. Colombians and Cubans stand out in this analysis. Not surprisingly given legal restrictions on their contacts, Cubans were significantly less likely to be transmigrants compared with all other country of origin groups. Mexicans, on the other hand, were not statistically different from other immigrants from Latin America, though they were much less likely than Colombians to be transmigrants. Colombians are the most likely of all to be transmigrants. When other related factors are taken into account, this specific national origin effect is reduced, largely because Colombian immigrants have other traits that are associated with a high level of cross-border involvement. However, even after controls, Colombians still display a pattern that is distinctive from those of other national origin groups. Years of residence in the U.S. as well as the age at which respondents migrated also make a difference. When compared with immigrants who have lived in the United States for 10 to 19 years—the largest group in the sample—the more recent arrivals seem much the same. Controlling for other background factors, however, they show a much lower propensity to be transmigrants; they are also much less likely to be transmigrants than immigrants who lived in the United States for 20 to 29 years. Similarly, the longest-settled cohort—those who have lived in the U.S. for 30-plus years—are significantly less likely to be transmigrants than the cohorts who have lived here for one or two decades. The strongest settlement factor, however, is related to the age at which immigrants moved to the U.S. No transmigrants appear among those who came to the U.S. under the age of 12. In addition, those with at least one child still living in the home country are almost twice as likely to be transmigrants as the average immigrant. Indeed, that factor has the most powerful effect of all, after controlling for others. Lastly, naturalized citizens were more likely than their non-naturalized counterparts to be transmigrants, largely reflecting the way in which possession of citizenship facilitates travel home. Do immigrants who engage in many cross-border activities have stronger or weaker attachments to the U.S. compared with other immigrants? And are their attitudes toward their countries of origin different? In this section, a statistical analysis is used to look for associations between each measure of cross-border activity and the 11 indicators of national identity and attachment already discussed. Since cross-border activity is affected by the same factors that influence national identity and attachment (citizenship or years of residence, for example), the statistical analysis controls for these other factors and isolates the unique impacts of cross-border activity. The analysis shows that differences in the number of cross-border activities have statistically significant impacts on a broad range of national identity and attachment indicators. Immigrants with more cross-border activities tend to say their “real home” is their country of birth, and they are less likely than others to plan on staying in the U.S. They are also less likely to view the U.S. as the locus of their political concerns and to think that morals and political traditions are better in the U.S. than elsewhere (Figure 9). The analysis found that cross-border activities still exercise statistically significant effects even after controlling for other, possibly influential factors, such as years of residence or citizenship. However, even immigrants with the highest level of cross-border activities appear to have shifted attachments from their native countries to the U.S. The statistical analysis shows that, among those with three cross-border activities, 67% still plan to stay in the U.S. The analysis also reveals that the U.S. is the locus of political concerns for half (48%) of those with three cross-border activities (Figure 9). In sum, it seems clear that higher levels of cross-border activities have a distinct effect in weakening identification with, and attachment to, the U.S. However, the impact is strongest on symbolic matters, such as whether moral values are better here or there, as opposed to more practical aspects, such as plans to remain in the U.S. or return to the country of origin.